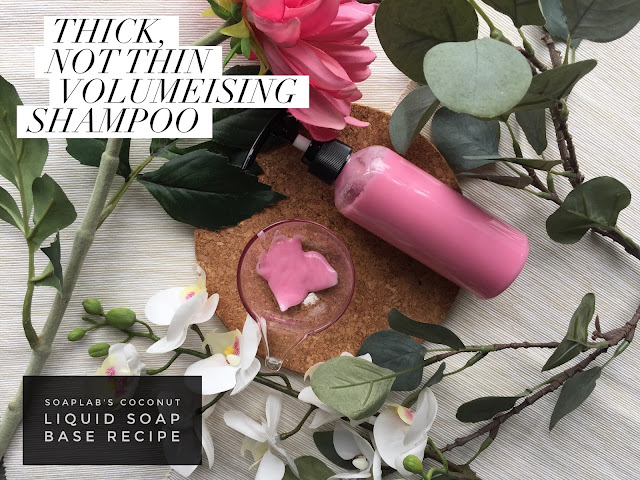 Hi all, its been a long time since we have posted any shampoo recipe. Yet, all of us at SoapLab use our in-house recipes for shampoos. So we actually have so many recipes we really liked that we can share with you! So for today we are making an argan oil based shampoo which works amazingly for dry and damaged hair, especially if you have been coloring or using heat styling very frequently. Argan oil is not only known to be great for your hair, but also scalp. It nourishes and repairs your hair so that your locks will be shiny and bouncy all the time. We use our in house SoapLab liquid shampoo base made from mild ingredients suitable for your scalp. Next, we use Nectarine Mint fragrance oil for a citrusy cool scent you will love for sure! You might be wondering why we are using oils in our shampoo... this is because we wanted to add in some extra love and care for our hair of course. Just because there is oil, it doesn't mean this shampoo will leave your hair oily, it will simply only repair and nourish your hair so it recovers from the previous damages. Enjoy!